The history of the Rocky Mountain Horse from 1890 to the latter part of the 1900s carries little or no documentation and few facts that can be proven beyond the shadow of doubt. Everyone who personally witnessed the breed's beginnings (back to the 1800s) is deceased, and we have been left with only verbal history passed down from generation to generation. Thus, all that can be recorded at this point in time are the stories recollected by living descendants. The Rocky Mountain Horse breed originated in the United States in the late 1800s, in the foothills of the Appalachian Mountains of eastern Kentucky. At the time of its beginnings, there was no understanding of the need to document anything about it. The people living in this region were quite unaware that one day their utility horses would become the foundation of a special breed of horse. The existence of these horses was practically a secret for many years to all but the inhabitants of this region. During the late 1800s and early 1900s, the rural inhabitants of eastern <?xml:namespace prefix = st1 ns = "urn:schemas-microsoft-com:office:smarttags" />Kentucky considered these saddle horses to be horses for all seasons. They were sure-footed, easy-gaited, and the mount of choice for postmen, doctors, and traveling preachers. People used them for plowing small fields, herding cattle, traveling through the steep and rugged trails, and driving the buggy to church on Sunday. Horses were not a luxury, but a necessity. Every horse had to earn its keep and be extremely versatile. It was not a matter of having horses around to use every once in awhile; these horse were worked hard, every day. At the end of the day they were exhausted, but possessed enough stamina to continue on, day after day. The families of eastern Kentucky who owned these horses were not wealthy and could not afford to spend a lot of money on the upkeep of their horses. Unlike Kentucky Thoroughbreds that were owned by wealthy people, the gaited horses of eastern Kentucky received no special care, and as a result the weak ones did not survive. These horses withstood the harsh winters of eastern Kentucky with minimal shelter, and they were often fed "fodder", a kind of rough silage. Some had to exist on whatever sustenance they could find. So, like deer, they ate the bark off trees when they were hungry. Only the horses that survived these extreme conditions lived to reproduce their kind. The Rocky Mountain Horse Association's (RMHA) version of the history of the breed states there was a gaited colt brought from the <?xml:namespace prefix = st1 ns = "urn:schemas-microsoft-com:office:smarttags" />Rocky Mountain region of the United States to the foothills of the Appalachian Mountains in eastern Kentucky around 1890. He was referred to as "the Rocky Mountain Horse" by the local Kentucky people because of the area of the country he had come from. He is the horse credited for the start of the Rocky Mountain Horse breed. Little is known about this foundation stallion, but oral history indicated he was chocolate-colored with flaxen mane and tail, and he possessed a superior gait. The stallion was bred to the local Appalachian saddle mares in a relatively small geographical area and the basic characteristics of a strong genetic line continued. This prized line of horses increased in numbers as years went by, and these are the horses known today as Rocky Mountain Horses. 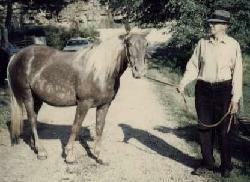 Sam Tuttle was the most prominent breeder of Rocky Mountain Horses for the first three quarters of the twentieth century. With the advent of better roads and means of travel, the population of gaited horses in the United States began to decline. The exception was the less developed area of the Appalachian Mountains. Gaited horses were still needed for travel where there were no roads, and therefore they were preserved in that area. Even through the hard times of the Depression and World War II years, Sam Tuttle kept a sizable herd of thirty to forty horses on his farm. Sam is considered as the man most responsible for the survival of the Rocky Mountain Horse. 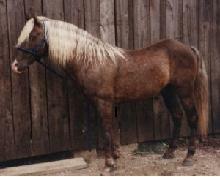 TOBE was the primary Rocky Mountain stallion used in Sam's breeding program. In the 1950s, many people were selling their stallions, and the horse population in general was rapidly declining due to tractors and farm machinery available. Even so, breeders remembered TOBE, and he was always in demand for stud service. People brought their mares to TOBE from several different states, and he was as famous in Estill County as MAN O' WAR was in Lexington, Kentucky. Everyone who rode TOBE fell in love with him. TOBE's offspring were always in demand, and Sam never had any trouble selling all the Rocky Mountain Horses he could produce. In the early 1960s, Sam Tuttle managed the trail riding concession at the <?xml:namespace prefix = st1 ns = "urn:schemas-microsoft-com:office:smarttags" />Natural Bridge State Park in Powell County, Kentucky. He had as many as fifty horses there, including TOBE. This stallion was often seen tied to the hitching post alongside all the mares. He became quite well known in the ten or so years he was ridden there. 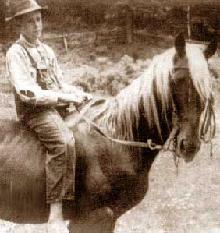 Besides breeding, TOBE was used as a trail horse. He carried Sam, and sometimes the trail guides who worked for Sam, with sure-footed ease over mountainous terrain for many years. Although Sam would allow other people to ride TOBE occasionally, it was always a ride closely supervised. He loved to show off his beloved stallion, but also kept a close eye on him. 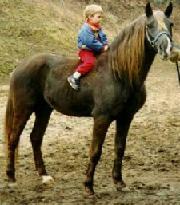 Everyone who rode TOBE enjoyed his gentle temperament and comfortable gait. It amazed people to think the well-mannered horse they were riding was indeed a breeding stallion. TOBE was used for breeding until July of his thirty-fourth year, and he passed on his gait, disposition, and other great qualities to his offspring. It has been said that TOBE's progeny followed in his "perfectly-timed" footsteps. TOBE fathered many fine horses before his death at the ripe old age of thirty-seven. One outstanding trait passed on to his get was longevity, as many of his offspring were still breeding into their late twenties and early thirties. *** The brief history above is an excerpt from the book "ROCKY MOUNTAIN HORSES" by Bonnie Hodge. The book is a complete digest on the breed and is scheduled to be released in 2005. Click Here to learn more about Bonnie's book and the beautiful stallions of Wildfire Farm. 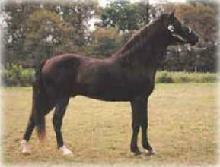 Like any stallion bred until age 34, Tobe had a multiude of sons and daughters. However, five of Tobe's sons went on to be especially important in the continuation of the breed. They include: Kilburn's Chocolate Sundown (KCS), Maples Squirrel, Sam Clemon's Tim, Sewall's Sam and Yankee. Each of these stallions brought its own qualities to the breed and people often refer to one of today's horses as being out of the Maples Squirrel,Tim, etc. line.